BY CRAIG: I have been working with the Naadi oracles in India as a way of identifying past life karma and clearing the path ahead by applying special 'remedies'. The Naadi triggered my desire to do social service and find a way to do my mediumistic work for free. The Naadi oracle will foretell good and bad things in your life. All these are a result of your karma and some things may not be possible to change. However the Maharishi seers who wrote the leaves also include spiritual ‘remedies’ that you can do to reduce or remove the negative effects of karma carried forward from past lives. Remedies include mantras, homan, temple visits and also charitable acts. For people genuinely interested in seeking the true purpose of their life and who are prepared to make sometimes arduous journeys to fulfill the remedies that the leaves prescribe then I am offering through our conferences and seminars opportunities to consult the real Naadi leaves and undertake the charitable work that they prescribe. This can be quite costly though most of the money given goes directly to the needy and often is given with your own hands. If you would like to find out more please use the contact form. 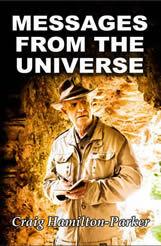 I do however suggest that you initially read my book MESSAGES FROM THE UNIVERSE which explains how it all works and is available through amazon.